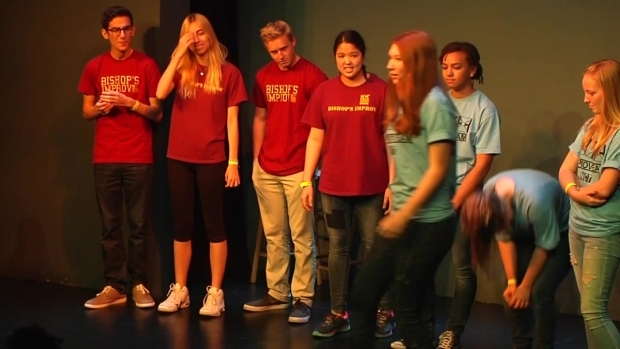 Improv comedy is taking root and growing among San Diego high schools. This is a story about improv comedy. I know, you’re probably thinking it’s misplaced being on a Sportswrap website, but believe it or not, what happened over the weekend was every bit a sporting competition. Rancho Bernardo HS, Coronado HS, Pt. Loma HS, School of Creative & Performing Arts, Bishop’s School, Patrick Henry HS, Francis Parker HS, San Ysidro HS, Mt. Carmel HS, St. Augustine HS, High Tech HS, Mt. Everest Academy, San Diego HS and The Monarch School. The rules are simple. Two teams of four performers go head-to-head, competing for points from a panel of judges, performing skits they have to make up on the spot based on recommendations from the audience. Think of it as Whose Line Is It Anyway? meets the NCAA Basketball Tournament. There’s even a referee keeping the games moving and awarding points along the way (by the way, all the performers were extremely funny and talented!). Sounds like a cool new thing, but this kind of event has been around for years. Centuries, really. Bishops School and High Tech High compete in an improv game where they have to say the worst thing you can say in a given social situation. Improvisational theatre has been around longer than the written word. Before human beings could communicate through text (no, not the electronic kind) we were sharing stories by acting them out. In the 1500’s, Commedia Dell'Arte became popular in Europe as performing troupes traveled between towns putting on shows they made up on the spot, within the framework of a certain scenario. In the 1700’s the art fell off as more scripted and dramatic performances took hold. But then in the 1930’s, it started a comeback in America thanks to Viola Spolin. She worked with immigrants in Chicago, playing traditional children’s games in workshops to help them become more spontaneous and less self-conscious in their new home. 40 years later, a professor at the University of Calgary named Keith Johnstone, who grew up in England, believed the theater had become too “elitist.” He wanted to bring performing arts to a more main stream crowd, the kinds of people who attended baseball games and boxing matches. It led Johnstone to invent a hybrid called Theatesports. Improv teams competed for points awarded by judges with active audience interaction. The idea influenced groups like (fittingly) Chicago’s Second City, the improv group that launched the careers of just a few well-known performers like John Belushi, Bill Murray, Gilda Radner, Dan Aykroyd, Jim Belushi, Mike Myers, Tim Meadows, Chris Farley, Adam McKay, Rachel Dratch, Tina Fey, Horatio Sanz, John Candy, Harold Ramis, Shelley Long, George Wendt, Jack McBrayer, Scott Adsit, Steve Carell, Alan Arkin, Peter Boyle, Joan Rivers, David Steinberg, Bonnie Hunt and Stephen Colbert, just to name a few. All that brings us back to modern-day San Diego. You may have mentioned a few names on that list from Saturday Night Live success. San Diegan Kyle Mooney is a current SNL star, and with all the talent that was on that stage at National Comedy Theatre this weekend he might be alone for long. The 2015 champions hail from Mt. Carmel High. They earn a chance to compete against a professional improv group on May 8th at the National Comedy Theatre. It’s certainly worth checking out. You never know, you could end up sitting next to Lorne Michaels as he scouts for new talent.